Snickers and Spot are brothers and were born in a Lancaster County, PA puppy mill. When they got “too old” to sell at 21 weeks of age, they were turned over to a Finding Shelter volunteer. They were very scared and unsocialized, would not walk through doorways and would cower near people, but have started to blossom and have learned to play and have fun! They love toys and to play chase in the yard. They are still building their confidence and are too afraid to walk on a leash but are slowly but surely feeling more like silly puppies every day! They need training but are very smart and love to learn. Their favorite thing is to jump up and give people kisses. 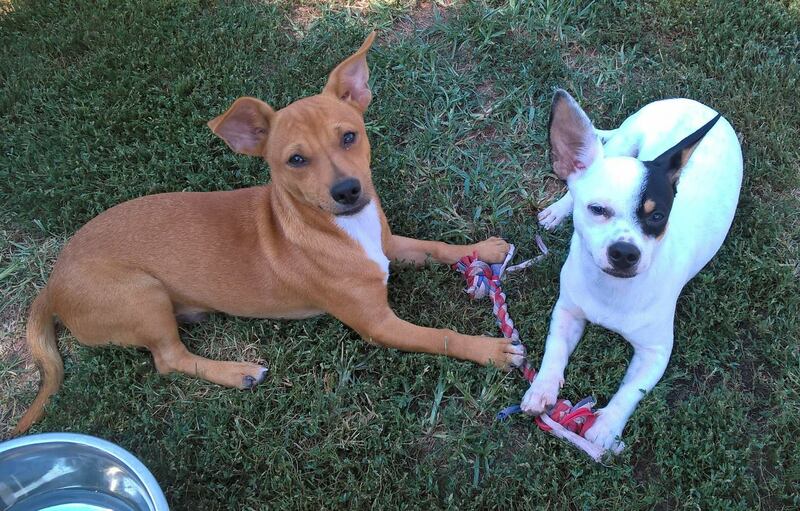 They are bouncy, loving, silly boys who love one another very much and are very bonded. *All dogs will go through a transition period after finding a new home and may need a “refresher course” in house-breaking.